Script writers: Itskov I., Rybakova A. Operators: Istomin A., Orlov U., Semin V.
About the sport development history in the USSR, how massive it is, democracy of physical education. 1 hour - Meeting of Soviet athletes Karpova and others. Story about gymnast Andrianova. Family Andrianova. Andrianov exercise on the uneven bars. Swimming competitions for boys and girls in Artek ( "Start of hope"). Heat. Press conference Lord Killanin. 2 hours - Leonov. Ran athletes, race reindeer sledding. Along the path Medeu runs Sadchikova. Stadium during the World Cup in volleyball. Volleyball match of the Soviet Union and Cuba. Athletics championships in Prague. V. Trofimenko - pole vault, steeplechase (women). 3 hours - Jumping B. Barnauskene, Yaschenko. Y. Vardanyan trains. Trained gymnast E. Mukhin, N. Shaposhnikov. G. songbird in the class sambo wrestlers coached children: shows techniques. G. Shatkov working in the studio. 4 hours - A. Freedom. Training biathletes. 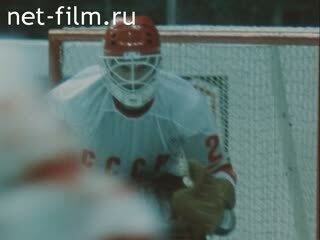 4-5 hours - Episodes of hockey matches teams of the USSR, Canada, Czechoslovakia. Commented N. Ozerov. Football match: LA Yashin in goal. 6 pm - Meeting Anatoly Karpov at the airport. Favor Karpov. Sports in Moscow: the Luzhniki stadium, Krylatskom and others. 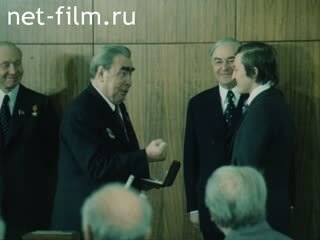 Meeting the organizing committee, Olympics-80. Corps Olympic village. Children involved in various sports activities (hockey, gymnastics, swimming). Meeting of the USSR national team swimmers: Yu Bogdanova, L. Kachushite. Gymnasts Andrianov and E. Mukhin down the ramp. Meeting at the airport champion Karpov. Gymnast M. Filatov during the competition. World champion gymnast N.Andrianov engaged in the gym with the boys, shows exercises on a trampoline. Chronicle 1976 21 Olympic Games in Montreal, Andrianov performs exercises on the rings, is in the first place of the podium. The city of Vladimir, the Golden Gate. 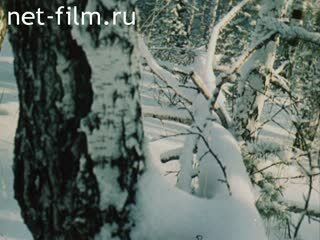 Family Andrianova - Andrianov, a son, a wife - gymnast L. Burda-Andrianov a walk in the winter woods. Andrianov family on holiday by the sea. Andrianov is training in the hall. Classes at the sports school: boys perform exercises. The final competition of schoolchildren in "Artek" "Starts of Hopes": long jump, run, swim in the pool. Athletes to the Olympics among the pioneers. USSR national team coaching swimmers in the pool, among them Vladimir Salnikov, Lina Kachushite Yulia Bogdanova. Coach swimmers - S. Wojciechowski correspondent. M. says Lord Killanin - IOC president, at a press conference in Moscow (simultaneously in English). Girl-athletes train in the park. Chronicle, 1978: Republican Olympics in Yerevan, festively decorated streets, people go to the stadium. Chronicle 1978: Olympics opening in Yerevan: fanfaristy play, shooting the flags of sports leaders - Cosmonaut Alexei Leonov, the pioneers give him flowers. Performance of athletes at the stadium, spectators in the stands. Runners ready to start, shot gun start, run and finish in the men. Children walk down the mountain on skis and sleds. The ice rink track "Medeo" run skaters. World Cup volleyball in the USSR in Leningrad: the bus go Japanese athletes, the spectators in the stands waving flags, chanting, exchange of souvenirs athletes. Fragments of the World Cup games in volleyball women's teams: Brazil, China, the Soviet Union - Cuba. Presenting Cup championship Cuban team. European Championships in Athletics in Prague rises plate, athlete V. Trofimenko running away with a pole and takes a high place; audience. Steeplechase: Start T. Zelentsova and other athletes, finish, first - T. Zelentsova her hug. Olympic champion Yuri Sedykh throwing the hammer, the audience. At the stadium, world record holders Yaschenko (high jump) and V. Bardauskene (long jump) warm up. At the European Championships in Prague Bardauskene jumps, spectators applaud, jumping Yashchenko autographs. Leninakan - Report on the streets, on the stairs down a group of young people, among them - with coach Yuri Vardanyan S. Vardanyan. Moscow: in the hall on the carpet train young gymnasts. Training of Soviet Gymnastics - Azarian, Dityatin, M. Filatov, N. Shaposhnikov, E. Mukhin. Coach amateur G. songstress is engaged in the gym with young wrestlers wrestlers, boys perform tricks. Two-time world boxing champion G. shaky in the gym, in the ring trains young boxers; Shatkov home in Leningrad, his daughter with a baby. Magazines with photographs of meetings with Shatkov K. Clay (Muhammad Ali) at the Olympic Games in Rome in 1960. Report on the streets of Leningrad, Monument to Peter 1, the Neva is a barge, people on the street, a monument to Pushkin, the people on the benches in the park, the embankment of the Neva. Chronicle in 1952: the Olympic Games in Helsinki Yu. Tyukalov kayaking finish first, the audience applauded. Tyukalov works in his studio (he's an artist-engraver) - the interior of the studio, working Tyukalova. Trained members of the USSR national biathlon coach - Olympic champion Privalov. Olympic champion Nikolai Kruglov and Tikhonov - members of the team - trained in shooting. Sunday at Uhtusskih mountains near Sverdlovsk, were factory race: youth with skis bus passes in the woods passing skiers, skiers, skiing scrubbed, smiling. Training skiers: the Ski run Kulakov, Savelyev, on a summer special track running athletes. Wedding Olympic champion officer SA S. Savelyev and E.Yavorskoy. The bride and groom wishes coach skiers Kamensky. Savelyev roller rides up to the coaches. Yashchenko to coach at the stadium. Andrianov and his coach Tolkachev. Coach V. Kapitonov with cyclists. Chronicle in 1960: the Olympic Games in Rome: passing two bicyclists near running mate watered cyclist, Italian athlete Livio Trappe, finish, crying Trappe, carried in the arms Kapitonova, Kapitonov on the podium. Flags of participating in competitions Motocross (near Leningrad): spectators with binoculars. riders on the track, leading Soviet racer G. Moses. Motorcyclists, finish. is the winner of motocross G. Moses. Boys wear a hockey form on the field playing the young players. Presentation of certificates of command at hokeynuyu Moscow "Dynamo", handed the Olympic champions Vladimir Vasiliev, A. Maltsev, parents watching kids. out on the field hockey teams (Soviet, Czechoslovak, Canadian, Swedish, Finnish). Fragments Games Ice Hockey World Championships, meetings CSSR Sweden, Canada - Finland, USSR - Canada, USSR - Czechoslovakia, poignant moments, the audience in the stands (in the audience Artist N. Kryuchkov) report is a commentator Nikolai Ozerov, the operator of television. Footballer L. Yashin at home gives interviews (synchronously). Yashin award - the Medal and the "Golden Ball". Chronicle: fragments matches with L. Yashin: USSR national team players with Yashin on the football field in London, Yashin takes the ball, sent the Italian striker Matsolloy, critical moments of games. By spectator stands is Yashin, the audience applauded him, the moment of a football match, Yashin among a group of people watching the game. Flags of participating in competitions in figure skating for the prize of "Nouvelles de Moscou", crystal horse. With young figure skaters talking Olympic champion in ice dancing LA Pakhomov. I. Rodnina and Zaitsev on the podium in the audience. Playing M. Cherkasova and S. Shakhrai. Moiseev and A. Minenkov. N. Linichuk and T Karponosov. Photo and film reporters at work. Photos of world chess champion Karpov. Karpov meeting at the airport. Rewarding Karpov in the Kremlin. : Brezhnev read greetings and presents Karpov Order of the Red Banner. Awards received in the Soviet sportsmen in international competitions. Moscow: the Kremlin, the building Library. Lenin Prospekt Kalinina, the Bolshoi Theatre, people on the street. Models of the Olympic venues. Construction of Olympic facilities, passing cars. Lenin (Luzhniki): Grand Sports Arena, construction HSS "Friendship", Krylatskoe: rowing canal, the stands, the view of the river. House in the Village, the interior living room. A meeting of the organizing committee Olympics-80 IT Novikov with foreign (Italian) sports organization, the conversation at the table. International exhibition "Sport - 78". Exhibits - balls, sportswear, appliances, TVs. Cyclists gymnast Markelov before the show thrower core Grizzly on the field. Chronicle: Glowing Olympic rings, a bowl with fire. Chronicle in 1956: the Olympics in Melbourne - runs V. Kuts. Zelentsova runs, takes over Borzov. Cyclist on the track, the core of Grizzly throws racers on the track, Andrianov gymnast on the high bar, Trofimenko takes height (pole vault), gymnast E. Mukhin in meditation training.